these are my top ten books I read this year. 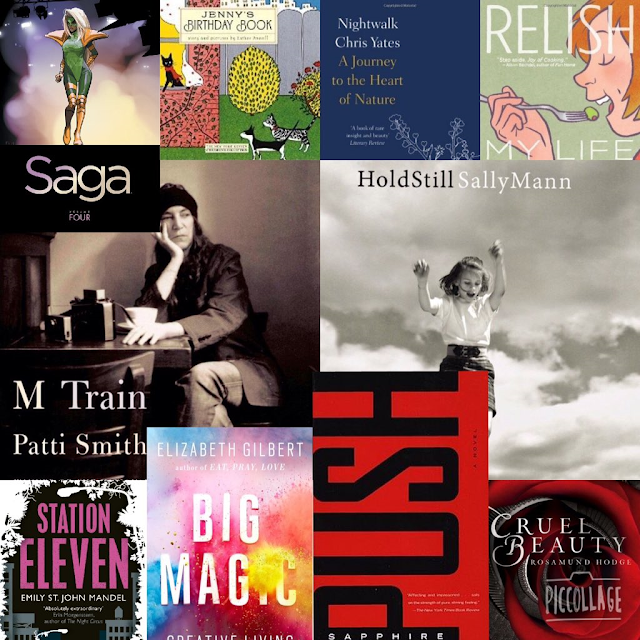 I read 101 books this year - a lot of them were young adult, graphic novels and yoga books. Don't think it was an AMAZING year for reading, but these ten books above are ace. my favourite of the year is Sally Mann's Hold Still - it's a memoir about photography, art and family and is beautifully written. 2nd favourite? probably M Train by Patti Smith. did you read Just Kids? how great was that? will this is just as great, except it's quitter, it's less exciting, it's Patti now rather than in the 70s, and what does patti do now? well, mainly reads and drinks coffee (as in has the ideal life), this totally wonderful! Station eleven by Emily st John Mandel was my fave fiction this year, and there's also some Young adult, graphic novels and nature writing in the mix. Have you read any of these? What were your favourite books of 2015?